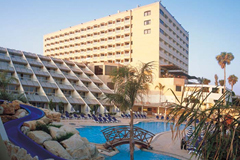 The St. Raphael Resort is a 5 star hotel located on one of the most renowned and largest beaches in Limassol, only a short coastal drive from the lively centre of Limassol, approximately 10 minutes away. There are shops, restaurants and bars within walking distance and a bus stop exactly outside the hotel. 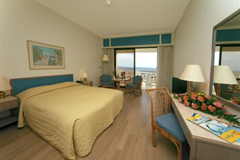 The hotel has 272 rooms and suites. All rooms are equipped with 26 inch flat-screen television with satellite, pay movies on demand and play station games, complimentary coffee and tea making facilities, direct-dial telephones, radio, safes and mini-bars. •	Sailor's Rest Lounge Bar Restaurant: Serves an array of gourmet cuisine with fresh fish, meats and pasta. •	Seashells Beach Tavern: Serves a variety of fast food, grills, salads and desserts next to the beach. Lunch only. •	The Palladium: Offers international themed buffet dinners with live musical entertainment. •	Octagon Restaurant: Serves American buffet breakfast, and international buffet, carvery, and salad bar for lunch. 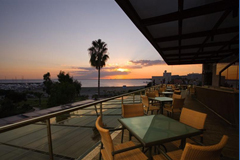 •	The Phoenician Restaurant: Serves a fusion of Mediterranean and Arabic cuisine meze. •	The Captain’s Bar: Offers the perfect retreat while enjoying cocktail favorites. •	Splash Restaurant: The perfect outdoor restaurant, offers fast food and a salad bar. Open for lunch and early dinner. •	The wet and dry Amphibion Pool Bar: A symbol of St. Raphael Resort, all guests can swim up to the bar and order from a wide variety of drinks. The Hotel features 5 conference rooms (various combinations can be made), 12 syndicate rooms, and a gallery area. Modern audiovisual equipment is provided, modern telecommunication facilities, high speed WiFi in all areas. Capable of accommodating up to 525 people in a theater setting. The Hotel provides 2 outdoor swimming pools, 1 indoor swimming pool, fully equipped gym, 2 tennis courts, beach volleyball and badminton courts, workout programs, steam bath, Jacuzzi, spa, scuba diving and all types of water sports.